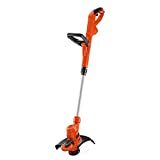 The BLACK+DECKER LST300 is our pick for the best string trimmer, which runs on a 20v battery and has a quality power drive transmission that makes it much more powerful than other brands. You can trim or edge with its unique design. Our step-up pick is the DEWALT DCST920B and it has a gear drive design and works with a dual line system of 0.080 inch. It has a bump feed mechanism and a variable speed option. The budget pick is the BLACK+DECKER GH900 and it has an automatic feed system and a powerful motor of 6.5 amps. It is also a corded type of trimmer. Also known as "weed eaters" or sometimes "grass cutters" or "brush cutters" in other countries, the string trimmer is a well-known tool for cutting up large heaps of grass. These tools are very helpful in shaping grass or even cutting large grass. These tools are usually used in conjunction with mowers because they make the task of mowing really long grass a lot easier than ever before. Before you can cut the grass, if it is too thick, you should trim it first to avoid making your machines load too much. This is helpful in prolonging the lifespan of your current engine. Unlike a lawn mower, they are best for really tall grass. You can use them for really thick and overgrown grass. These grass types are the ones that usually grow easily during certain climates. Remember that cutting grass too thinly can be bad so you should trim it lightly first with this kind of string whacker, so that your lawn will look nicely without the ugly and unpleasant patches of brown. This is also crucial for maintaining a healthy lawn. They can either be electric powered or gas powered. Electric and gas types have their pros and cons. Electric types can be either battery operated or corded. Those that run on battery have limited power and runtime but they can be used anywhere without the dangling cord and without much restriction. However, they are not very ideal for really thick or overgrown grass. Corded ones, on the other hand, provide a lot more power in the long run because of its unlimited source of power. The only downside is the dangling cord that could potentially trip someone and which can be dangerous. The gas types, on the other hand, provide the best kind of power, runtime and performance when it comes down to really stubborn grass. While the only downside that comes with these types is the noise level as well as the effects on the environment, they can be the definitive choice for those who maintain large acres of land and want to trim them without losing power. In addition to that, the gas type is also the best choice in suburban or rural areas and when noise levels are not an issue because the land area is in a remote part of the city or town. When you are using them, you should wear proper gear to avoid debris flying to your face. You need ample protection in using them. Safety gear such as goggles and helmets are important because they can protect your eyes and your head from flying debris and thus, preventing the likelihood of gashes or injuries when you are operating it. In addition to that, you may also need to wear appropriate clothing, such as boots, overalls and gloves in order to handle the said equipment safely. It takes a lot of power and endurance to handle these types of trimming machines, compared to a lawn mower that you just push around. They needed to be lifted and carried around, which can be tiring for most people who are not used to doing it. The weight of this machine is usually because of the heavy motor as well as the internal parts, especially if it is running on gasoline instead of electricity. Battery powered ones tend to be heavier as well due to having to carry the battery around in the housing. Gas or electric: Choose between gas or electric units and weigh in their pros and cons. Gas has its advantages of power for getting the job done in a quicker amount of time and is meant for tough grass. Electric units, on the other hand, are meant for medium and light grass as well as for urban areas where noise can be an issue. You should choose according to your best needs with the power source. Tank capacity (for gas types): Know the tank capacity of the gasoline engine to measure how much runtime on the average you can get. Tank capacity is usually measured in cc and you should get the appropriate one that you think may cover your entire lawn or yard. Battery capacity or power consumption (for electric types): the battery should last for a longer period of time so that you can know how much runtime you might get with just one charge. You should also know how long will the battery take to charge, and for corded units, how much power consumption you need in average depending on the size of your lawn and the time you spend trimming. Cutting speed: You should be able to cut with a good speed to save more time in the long run. The speed can vary depending on the model, and some of them can even have a variable speed, which can be helpful in terms of conserving the life of the motor itself. Ease of starting (especially for gas types): It should have an easy starting mechanism to put your troubles away. 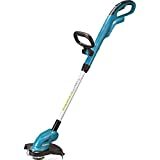 An electric start feature is important for any kind of unit since it makes it a lot easier to start your tool for you to get weed whacking right away. Attachments available: Consider the attachments that are applicable with it. The attachments can range from edging tools to other items that you can use to tidy up the grass in your lawn, as well as maybe other extras that come along to make your job much easier. Protective features: What other protective features does it have? The features might include a better shield against the debris that might come from the nylon part. Noise levels of the motor: Consider if the motor is less noisier than other brands. The noise level is important when you want to use this weed whacker in an urban setting where noise can be a critical issue among neighbors and other people around you. Ease of operation: How simple is it to operate? You should be able to start it with the use of only a few buttons and mechanisms and should not be over complicated when it comes down to its useful operation for you to trim your lawn with great ease. Weight: How heavy is it to carry around? A good weight is important, since, unlike a lawn mower, you will be carrying it for the rest of your routine to trim your grass, and having a heavy weight can be a stressful thing for you to have while operating such a machine for your garden or lawn. Nylon configuration: What is the nylon configuration? This can refer to the size that the trimming machine accepts. Some can accept thick nylon but some can accept thinner nylon, so you should know first before you buy. Cutting path width: Know how wide the cutting path is on the end. A wider cutting path is highly important for those with really large lawns or wider spaces for you to get the job better and faster. Style of the shaft: this can be either curved or straight. Curved and straight shafts have their pros and cons. Curved ones are much better for expert users but for the casual users, the straight shaft is much more preferred due to its easy maneuverability. Home or commercial use: Some use them at home lawns while others use them for commercial applications or purposes. Home use machines are usually not that powerful while the commercial use ones can be made for acres upon acres of land. As our top pick, the BLACK+DECKER LST300 is a good choice because you can either trim or edge with just one tool with the use of its 20-volt battery power. It uses runtime extension technology and a power drive transmission. It is also lightweight to carry around despite being battery powered. The only possible con with the BLACK+DECKER LST300 that is not a big deal is that it is battery powered, and therefore you should use it wisely due to the limited time in usage (unlike corded ones). As our step-up pick, the DEWALT DCST920B accepts dual 0.080 line and it comes with a quality gear drive design with a bump feed mechanism for easy line changing. The cutting swath measures 13 inches. Our budget pick is the BLACK+DECKER GH900, which is a corded unit for those who want unlimited power with its 6.5 amp motor. It is also equipped with an AFS or automatic feed system for easy line changing. 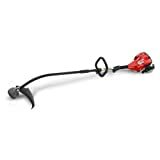 The WORX 32-Volt GT2.0 is a multipurpose tool that can be used for edging as well as for light mowing. It comes with a 32v battery that is of lithium ion for longer lasting power and can be charged using the included charger. It comes with a 90-degree head that tilts for your convenience. At 7,800 rpm for its cutting speed, the Makita XRU02Z is at 18v on its battery and is a good trimming machine that has an adjustable shaft that is telescoping in action. It also comes with a pivoting head and an ergonomic design overall. The EGO Power+ 15-Inch is a good choice for those with a penchant for a brushless motor that does not make too much noise. It takes any 56v lithium ion battery and has a split shaft design. The machine is meant for line that measures 0.095 inch. For those who want a gas powered machine, the Husqvarna 128LD can take any 0.095 line and has a cutting width of 17 inches. It has a powerful 28cc engine and has a straight shaft design. It is also detachable for travel and storage purposes. The Husqvarna 967055801 is an ideal choice for those who want a 4-cycle or 4-stroke engine and do not want to mix oil and gas anymore. It has an air purge feature for easy starting and for relieving the carburetor. It has a 25cc engine and a straight shaft design. The Remington RM2700 Ranchero is a 2-cycle or 2-stroke unit that has a cutting width of 8 inches and has a 27cc engine. You can use it for various hard to reach areas due to its lightweight design and smooth and compact cutting head. For those who want a curved shaft, the Homelite 26cc is a 2-cycle engine that comes with a quick fire carburetor technology that makes it easier to start. The cutting swath is at 17 inches for extra cutting power and it also has dual line bump feed for easy line changing. Others that did not make it to this list were too noisy and too bulky to operate. They were also prone to getting damaged and having a motor problem so we left them out. A whacker needs to be durable and at the same time powerful yet light enough to be carried for trimming tasks. Q: How do I use a string trimmer? 1. Make sure you are prepared with your safety gear for you not to get hurt or injured. 2. Hold the trimming machine head just level above the grass, especially if things are in the way. 3. Vertically hold the weed machine so that you do not make mistakes near a flower bed. 4. For installing new nylon strings, the head’s spool should be removed and then replaced with new string that measures about 8 feet long, then you can cut the excess. 5. Consider running the machine faster if you are out of line so that you will be able to shake off the excess line or nylon that is left. 6. Make sure that you are not using the trimming machine around tree trunks because it can potentially hurt the bark of the tree. 7. Follow the instructions of the manufacturer in terms of replacing the string on the spool of your trimming machine, so as not to cause errors in your operation. 8. Consider using a gas trimmer or any noisy trimmer only when there are no people around, or if your land area has little to no neighbors around, because it can disturb others. 9. Be prepared for debris so you need to keep people away from your trimming machine while operating it, just as you would on a lawn mower. 10. Make sure you know how to properly mix the fuel and oil ratio for your machine if it is gas powered. Q: What are the differences between the gas type and the electric model? They are mostly used for large areas of land where noise is not a problem. They are mostly used for residential homes that are in an urban setting. They can be very powerful, at about 1 to 2 1/2 horsepower, which makes them more ideal for large land. They are weaker in power, from about 1/8 to 3/4 horsepower, which is basically 3 to 6 amps. Gas types are usually the worst when it comes down to starting them, especially in the winter. This is unless your gas type has an electric start feature that makes it unique. Electric types have the advantage of easily starting so they are less frustrating to use overall. The durability of this kind of trimming machine is usually the best because of its powerful motor, unless it will be abused for its usage. They are usually not that durable because they will most likely be used only for urban and light applications. They tend to be heavier because they come with a gasoline tank, so this can be much more stressful for the operator. The motor can sometimes be too heavy as well. The corded ones are the lightest of all but the cordless ones can be heavy as well, but that depends upon the weight of the battery unit. The noise level of the gas powered ones are usually very high so they are not preferred by those who live in urban areas where noise is an issue. If you want a less noisier unit then you can go for electric models, which are usually quieter. The runtime is pretty good, depending on the amount of gasoline you have and the capacity of the tank. Unlimited power can be obtained with the corded models but the cordless types can have a limited amount of runtime overall. The lawn size that you should have with this kind of trimming machine is usually medium to large. The lawn size can be somewhere from small to medium, since it is meant for light application. It might be more prone to fire because of the gasoline content in the tank. In addition to that, the mixture of fuel and oil can be a problem for those who aren’t used to it. If you follow the instructions carefully and if you get a decent unit, electric models are a lot safer in general in terms of operation. The gas types are usually meant for commercial applications and for larger residential units that have acres upon acres of land. They are mostly meant for light applications such as for home use. The price can be usually much cheaper but that depends on the dealer. The price can be more expensive if you go for the battery type, since it is portable. The cordless ones are priced just right. The maintenance can be hard for the gas type because you have to maintain the fuel, engine, oil and many other aspects. The electric models are usually less to worry about when it comes down to maintenance problems. The gas type is usually available in most hardware stores. The electric type is available in select hardware stores, especially those that sell high-end models. They can be used on nearly any terrain type and has a wider scope of operation because they don’t have a cord to restrict them. They can operate wider if they only run on battery, but otherwise, corded ones have limited operation. Q: What are the different kinds of cutting techniques? 1. Tapering – this is done by going into the edge of the lawn and making sure that a clean look is achieved with the edges. It can also refer to edging but that is a different story altogether. The way to do is to use an angle while going against many objects of interest in your lawn or yard, such as a fence or a tree or even a wall. 2. Edging – this one is different from tapering because this is more of going against objects that are not solid or upwards, and are mostly flat, such as the driveway or any path or walkway or even a patio. The edging technique is quite similar to tapering. However, is done in a different way and may also potentially pick up debris like rocks so make sure you wear safety gear. 3. Scything – this is a type of technique that requires a u-shaped motion so that you can work on the grass that is too tall to handle for most weed eaters and machines for trimming. They are great for making an even cut with your machine or tool. 4. Screeding – this is also ideal for most who have sidewalks, driveways and paths that have concrete cracks that you can clean up and trim of excess weeds that grow out of them for a neater and cleaner concrete path. It should be done carefully so as not to lose string and also to trim evenly. Q: What is the fuel or gas mix ratio with oil for any weed eater? A: The defining thing about gas type weed eaters is that they need to have a proper ratio of gas and oil in order to work. This is mostly seen in a 2-cycle engine because they need to keep the parts lubricated while refueling the tank, such as the piston and the crankshaft. Without a lot of oil, it will make the parts hard and brittle but too much oil will also make the engine lose its lifespan eventually. a) Make sure you use quality oil that is meant for 2-cycle engines only, otherwise it might make your engine look bad. This is especially the case if your engine has been used for a very long time. b) Consider clean gasoline with at least 87 octane and less than 10 percent of alcohol. Consider a higher grade of gasoline if your engine has been used for years or if it is a second hand weed eater. c) As much as possible, don’t use car oil because there are additives that don’t really work well with 2-cycle engines of string machines. d) Make sure you read the user’s manual for the oil and gas ratio to mix. In some cases, you may also get a different ratio recommendation from the manufacturer. For instance, some may want to have a 50:1 ratio instead, in which 2.6 ounces of oil should be included in 1 gallon of gas. Q: What are the regulations for a portable fuel container? A: A portable fuel container is a type of container that is meant to hold or store liquid fuel for various gas powered machines that you are probably using in your home yard, such as leaf blowers, string trimmers and lawn mowers. They are popular in the United States but can also be used in other countries in which there’s winter season that can potentially make fuel look bad when stored. 2. The can body should be made with special treatment so that the fuels will be less permeable. 3. There should be no openings or vents with the single opening or single vent that is located in the fuel container for safety. 4. It should be childproof when it comes down to its features as said in the Children’s Gasoline Burn Prevention Act, especially for people with children in the house. If you have an old PFC in the house then you can potentially exchange those in your local government unit if they have an exchange program so that you can comply to the new rules and regulations of the EPA for safety purposes. Q: What are the most common problems that you can encounter in a weed eater? a. It can be hard to start because of a problem in the spark plug spacing. b. The fuel might have been contaminated with water when you are mixing oil and gas. c. You might not have properly mixed the right ratio of gas and oil in the tank. d. The carburetor might have to be cleaned. e. Electric engines might have been used too much for grass that is too thick. a. If you use a string that is too thick for your machine then that can potentially break your engine, so make sure it is just the right thickness. b. If the line does not advance then you can just stop the machine and pull it up manually or lubricate the head later on. 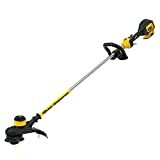 Q: How much should people and objects be far away from you when you are using this kind of trimming machine in the lawn or garden? A: You should make sure that every person, child or pet is at least 50 feet away when you are using this kind of machine, so as not to cause potential injuries and send off flying rocks or other small debris around the vicinity. Make sure you warn others that you will be using it because they can get noisy once you start them and communication might be blurred when you are using this kind of tool. Q: What are the differences between the curved shaft type and the straight shaft type? They are usually much longer in terms of cutting diameter. They are usually slightly shorter or the same with cutting diameter. Most of them can accept shorter string lengths. Most of them can accept longer string lengths. They tend to be much heavier but that can vary depending on your brand or model. They tend to be much lighter but that can also vary between brands. The length is usually much longer because it is straight in its design. It offers for more reach. The length is usually much shorter than that of the straight shaft because of its curve or angle. 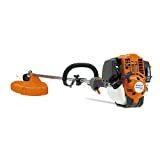 They are meant for heavy duty use and for larger lawns that need a lot of time spent in trimming. They are meant for residential areas with smaller lawns that are only in need of light to medium duty use. Q: What is mulching and why is it important? 1. It makes your soil much healthier because it adds nitrogen. 2. It helps you to reduce on bagging costs. 3. It helps Mother Nature by reducing on bagging. 4. Dump sites don’t get filled too much with bags of grass clippings. However, there are times when mulching is not applicable, such as if you have weeds, so mulching should be done strategically. In addition to that, if you have pesticide and synthetic fertilizers then mulching may not work as effectively as you think it would. Q: How do I replace a broken shaft? 1. Pull the shaft from the drive tube of the trimming machine by taking out the cutting head. 2. Work on a flat surface and take out the spark plug wire. 3. Look for the hole behind the cutting head and the deflector lines. 4. Use a locking pin or hex wrench (1/4 inch) to remove the head without turning the shaft. 5. Safely remove the locking pin if the head has been unscrewed. 6. Pull off the thrust plate, deflector and release the clamp. 7. Use a screwdriver to loosen the fixing screw to reveal the shaft end. 8. Take out the shaft using adjustable pliers out of the drive tube. 9. Lubricate your new shaft and then put it into the drive tube. 10. Secure the new shaft with pliers and make sure it is extended at only 0.6 of an inch. 12. Put back the gear housing and the fixing screw. 13. Clamp the deflector and put back the thrust plate. 14. Put back the locking pin and the cutting head to screw it back into place. Q: What are the PPE or personal protective equipment I should wear when using this kind of tool? 1. Goggles – for protecting your eyes against debris that fly into your face. 2. Long pants and long sleeves – for protection against flying debris and nylon strings. 3. Gloves – so that your hands don’t get sore or tired through handling the machine all the time. 4. Mask or other face protection – you should wear this if you use a gas type, since the fumes can be harmful to your lungs. 5. Ear protection – you can wear earmuffs or ear plugs if the noise of the string machine is too much for you to bear, so as not to damage your hearing overall or in the long run. 6. Full face protection (a.k.a. ninja mask, optional) – this is in case you need to spend hours under the sun with your weed eater and you don’t want your face and hair to get debris as well. Q: What are the differences of 2-cycle engines and 4-cycle engines in string machines? The weight of 2-cycle engines is usually lighter. The weight of 4-cycle engines is usually heavier due to more parts. Because they have a smaller engine, they tend to be weaker in power. They tend to be much more powerful due to being larger in size. They require you to mix a ratio of 40:1 or 50:1 for gas and oil. They don’t require you to any kind of mixing because the oil tank exists for your convenience. They tend to be much noisier. The 4-stroke design makes it less noisier than the 2-cycle one. They tend to be much cheaper than the 4-cycle types. They are usually much more expensive compared to the 2-cycle engine types. They are the best for moderate to heavy usage. They can be used for heavy to super heavy duty usage. Q: How do I store the string trimming machine properly? 1. Make sure you run it until the fuel has run out before storing it. 2. Clear the tank of any remaining fuel as much as possible. 3. If you are storing fuel, consider a portable fuel container that complies to the EPA standards. Q: What sign should I look for if the string machine’s engine has a wrong mix of gas and oil? a) Start the string machine on a regular idle speed. 1. Make sure you don’t use car or automotive oil for the gas tank. 2. Always use air cooled engine intended 2-cycle oil (some are for water cooled types). 3. Always follow the 40:1 or 50:1 ratio in mixing gas and oil, or whatever your manufacturer says. 4. Give the container or gas tank some shaking so that they are properly mixed together. 5. Dispose any left oil or gas responsibly in a waste facility, not on the ground. Q: What are the differences between corded and cordless models? They are usually lighter in weight because they don’t have a battery to carry around. They have a battery to carry around so it adds to the weight. They are not portable because you need to plug them to an outlet. They are more portable because they are cordless. They tend to be less safe because of the dangling cord and outlet. They tend to be safer because they are cordless in design. They tend to have more power because they have unlimited supply of power and energy. They tend to have less power and are limited to the battery power that you currently have. They tend to be easy to use but can be frustrating if plugging or unplugging them later on. They are easy to operate but checking the battery levels can also be a chore for some people. Most corded ones are pretty durable. That depends on the model, as cheaper ones can be less durable. The cost of corded ones is so-so but that varies depending on the brand. They tend to be much more expensive because of the battery, unless you get a unit without the battery at all. Maintenance is not much of a problem with a corded unit. Maintenance can be a problem because you need to charge the batteries once in a while. Q: What is the difference between an automatic and semi-automatic feed system? A semi-automatic system requires you to feed the line manually every single time. A fully automatic system can be much more of a choice if you want convenient trimming. Q: Aside from string trimmers, what are the other lawn care equipment that I can use for maintaining my grass? 1. Edger – this tool can help make edges in your pathway to create a nicely finished landscaped look. 2. Spreader – this one is used for putting seeds, fertilizers and pesticide onto your garden or lawn. 3. Rake – this is used for raking leaves in the autumn or fall, and also for raking other debris in the yard. 4. Leaf blower – they are used for gathering large heaps of leaves that can’t be done with a rake. 5. Lawn mower – this is used for cutting the grass much more evenly than a string trimming machine. 6. Sprayer – this is also used for applying pesticide and other spray formulas. 7. Aerator – this is used for adding oxygen to your current water source. 8. Dethatching tool – this one is used for making the soil healthier by thatching. 9. Soil thermometer – this is used by some for measuring soil temperature. 10. Hand tools – there are also some hand tools for weed removal. Q: What are the common causes of a string machine not starting? Q: Why should you trim when the grass is dry? A: Trimming when the grass is too humid or wet can make your engine fail easily because of the water that might get into the engine as well as the weight of the grass clippings due to the water content. Therefore, you should wait for the grass to dry a little bit before trimming or mowing. Q: What should I do if my spark plug is dirty or faulty? Overall, the BLACK+DECKER LST300 is our pick for the best string trimmer due to the powerful lithium ion battery, unique edging option and its power drive transmission.